Well, packing took a lot longer than expected… so, with only 3 hours of sleep in my, I got up at 6:30 for our 7:20 departure. I made my way downstairs into the breakfast room for the last time and received my final cup of coffee. I also had to have a piece of bread with butter and jam, since I knew it was the last time I’d be doing that for a very, very long time (very). At 7:20, after saying our thanks and farewells to Madame, I trudged through the pouring rain with my too heavy luggage in my completely impractical flats and dress onto the bus. I was a little optimistic about the weather… hoping Paris would be nothing but sunshine. At 8:30 we boarded our TGV train to the Gare de Lyon. When we arrived, we regrouped and parted ways. It was bittersweet and surreal as one by one our group members broke off and disappeared with their luggage among the sea of people crowding the train station. No more sadness. 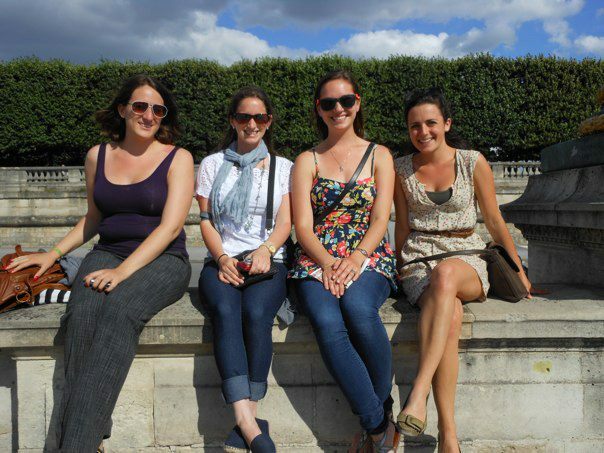 After all, the glass really is half full: there was five of us still together and we had a full day in Paris! We went downstairs in the station to purchase metro cards for the day which we took to get to our hotel. As soon as we walked out of the meto station and onto the street, directly in front of us stood the Moulin Rouge! It looks just like in the movie! That is, except that it stood surrounded by several other buildings in a bustling city, but it was really cool no less. We lugged our bags to our hotel (2 too many flights of stairs for my liking) and arranged for taxis to take us to our respective airports at 4am. The other girls had visited the Louvre when they’d arrived in Paris two weeks ago, but I still really wanted to go. So we split up and I tried to go. Now, once a month the Louvre has free entry, this day being the first Sunday of the month. I didn’t know this. Today was July 1, and a Sunday. There was an hour and a half line just to get in. I arrived at 3pm, wouldn’t get in until 4:30, and the museum was set to close at 5:30. I accepted my loss and gave up hopes for going to the Louvre. Instead, I made my way back to Notre Dame, this time to check out the inside which I had not been able to see the week before. When on my way there, I walked through what I thought was a with food or souvenirs, but actually turned out to be a slew of vendors with pet birds. I found this very interesting. As with most old churches, Notre Dame was gorgeous. I took a metro back to our previously designated meeting place, so that we could all walk to the Eiffel tower. En route, we purchased our final French ice cream cones. As we neared the Eiffel tower, I became thoroughly confused. Did you know the Eiffel tower is brown? Like mocha cappuccino brown? Not black, or grey, or slate, or silver or even dark brown. Nope. It was light brown. I was amazed. Anyway, aside from the color-shock, the Eiffel tower is amazing. We couldn’t believe that we were standing right under it. It’s massive and really just a phenomenal structure overall. 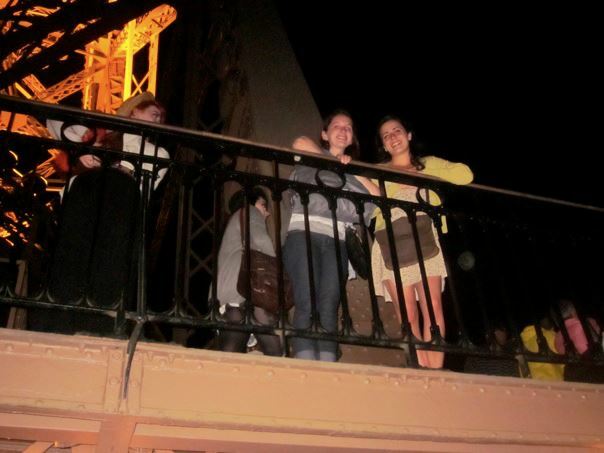 We decided there were three things we needed to do that evening: dinner, boat cruise, and climbing the tower. We started with dinner where we enjoyed escargot for the last time, I had just a bit more goat cheese, and I finally tried Kir, a French aperitif of white wine with crème de cassis. 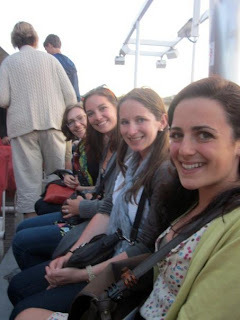 We then headed a few blocks over for a boat tour which would take us past several sights just as the sun was setting. We popped a bottle of wine on the boat, sat back and took in the beauty of Paris. Even better, when we were standing on line, an English-speaking woman gave us three tickets for the cruise which she didn’t use. So instead of it costing 9 euros each, it only cost us four. 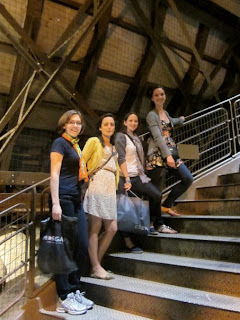 We headed over to the Eiffel tower around 10pm to begin our ascent. Unfortunately, as we were walking toward the ticket line, they closed the gates for admission to the top. We at least still had the chance to walk to the second level, which was definitely better than nothing. Somehow, I got lost in the excitement and completely missed the Eurocup final. I saw crowds of people flocking over the bridge away from a jumbotron on the other side of the river. The game had ended between Spain and Italy. Soon enough, the faint “ole ole ole ole” chant of a Spanish victory became audible and I knew that Spain had secured their third cup title. I was ecstatic! People were dancing, singing, and cheering for hours. Cars were honking their horns and passengers were leaning out of the windows, raving. I wish I’d seen it! Just when we were about to descend from the second level of the Eiffel tower, the whole thing began to glitter and light up. It was a really cool sight to see. We caught taxis back to the hotel and repacked our luggage. I was able to squeeze in a twenty minute nap before having to wake up again and head down for our taxi. I’m currently sitting in my terminal in Charles de Gaulle airport watching the bellies of the clouds outside shift from shades of blue to lavender to pink-peach, and gold as the sun is rising over the horizon. Again, this has been the experience of a lifetime. I will never forget the friends I’ve made on this trip or the perspective which I have gained. I now have a new respect for France, especially having seen it from the small town setting where the meaning of French still reigns true, unaltered by tourism. I’ve been blessed to have this opportunity, see so much, and meet so many wonderful people. But I’ve also learned a tremendous amount and have begun the sow the seeds for a passion for cheese and wine and culture, an integral factor, which I hope to continue to cultivate. On one hand, I’m sad to leave, but I’m also excited to be home and see my friends and family so that I can share my experience with them and apply everything that I have learned here to my life on New Jersey soil.